Click on a golf course or lodging property on the right sidebar and it will show you where it is on the map- including a picture, name of course/property, address, directions and link for more information on our site where you can also book your golf trip. For a truly unique view- be sure to click satellite orhybrid for a real bird's eye view! Remember you can also drag the map to move it and zoom in! Have fun! Home of the PGA TOUR' Waste Management Phoenix Open, TPC Scottsdale is a resort and daily fee facility offering 36 holes of championship golf. Designed by the team of Tom Weiskopf and Jay Morrish, the Stadium and Champions courses offer a masterful blend of challenge and playability for all levels of golfers. 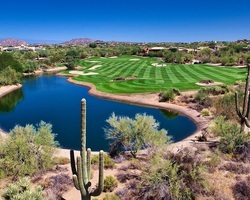 Operated by PGA TOUR Golf Course Properties Inc., the facility is located in the beautiful Sonoran Desert surrounded by the majestic McDowell Mountains. 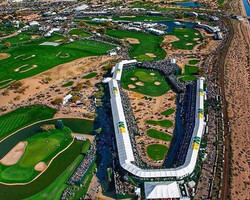 As the PGA TOUR stop with the largest crowds of any golf event in the world, the Waste Management Phoenix Open brings immeasurable attention and respect to TPC Scottsdale's Stadium Course, which was renovated in 2014. The end result was more aesthetically pleasing to resort guests and strategically more challenging to PGA TOUR players during the tournament. *Complimentary forecaddies are included in the 18 hole rate through April 15, 2019. The recommended gratuity is $25 +/player. 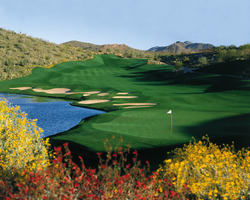 **Tee time rates are dynamic, and change daily** - be sure to ask your Golf Vacation Specialist!